In Uganda, access to any medical care is a luxury. There is one doctor per 10,000 people. Medical volunteers work around the clock to meet the severe physician shortage in the country — sometimes five months straight without a break. While the cash-strapped country spends no more than 10% of its budget on solving the crisis, one man has taken matters into his own hands. His story is both harrowing and inspiring. Christopher Ategeka went from being a human scarecrow (yes, you read that correctly) to one of Forbes&apos; 30 Under 30. In an "Ask Me Anything" session on Reddit, Ategeka explains how he went from a life of poverty and orphan-hood in Uganda to international success as a leader in technology. 1. An orphan at five years old. At just five years old, Ategeka lost his parents to HIV/AIDS, becoming an orphan and the caretaker of his four young siblings. He would later lose one of his younger brothers under his care. Forced to work on his uncle’s farm as a human scarecrow, Ategeka chased birds and other animals away from crops day in and day out, always worrying about his next meal. 2. He is now one of Forbes&apos; 30 Under 30. Today, Atekega is using technology to help over 10,000 Ugandans in need of access to health care. He is the CEO and founder of CA Bikes, a nonprofit that designs, manufactures and ships ambulance bicycles to remote areas in Uganda. 3. Transforming rural health care in Uganda. Eighty-seven percent of Ugandans live an average of five to 10 miles away from a health clinic or hospital. For a sick child, a person in need of medicine or a woman in labor — transportation via ambulance bicycle could mean the difference between life or death. "I didn&apos;t know what technology mean[t]. You are only worried about what to eat today and that&apos;s about it," Ategeka said in response to a question about technology in Uganda. 5. For Ategeka, education made the difference. One family began sponsoring Ategeka through a Christian based nonprofit named Y.E.S Uganda — donating $25 dollars a month to help him as young orphan child. They later would provide him a home and a university education in Oakland, Calif. 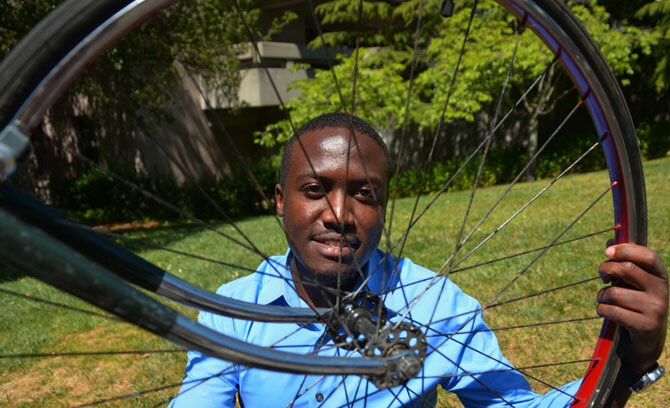 Scaling the heights of university success, Ategeka started his education at a community college in California, working his way up to a Ph.D. in mechanical engineering from U.C. Berkely. "I am the luckiest guy alive ... I am leaving the dream — three meals a day ... (That&apos;s luxury by the way) I have enough to never have to worry," said Ategeka. 7. When philanthropy doesn&apos;t cut it. While Ategeka&apos;s life was radically transformed by philanthropy, he argues that Africa needs more. "There is simply not enough philanthropic capital or foreign aid to solve Africa&apos;s problems on the scale they exist in the foreseeable future. To defeat Africa&apos;s challenges we must harness truly sustainable and scalable models by creating jobs for Africans and give them the tools to solve there own problems," Ategeka said. 8. Surviving multiple near-death experiences. The entrepreneur faced many harrowing experiences in his life, including a near-death experience with a chimp. When he was about nine-years-old, the young boy was running home from the field when he came across a baby chimp that appeared to be abandoned. Grabbing the small animal, he thought he would help the baby. But the baby chimp&apos;s mother was nearby. Ategeka was nearly killed. 9. How did he do it? "The short answer is passion! If you don&apos;t know your passion; dig deep within — its in there. Because with passion comes determination, and hard work, and the desire to get to the top," Ategeka said.